Inyathelo commissioned this report in 2013 when it became evident that government was exploring the implementation of a new NPO Act. 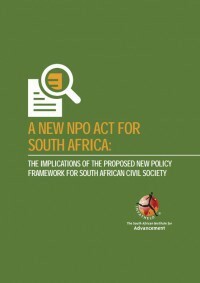 Researchers interviewed experts on non-profit law, NPO leaders, the NPO Directorate itself and others who are interested in the viability of the sector in order to gain a clear understanding of what is proposed and what process is envisaged by government in taking this forward. Complete the form below to download the full report, or read the report summary here.